The perfect combination of MSI gaming laptops and 7th Generation Intel ® Core™ i7 Processors shall bring you up to 10% performance enhancement of smoother VR experience. 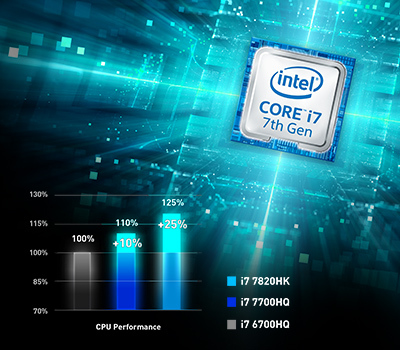 The 7th generation Intel Core H series processor utilizes a power-efficient microarchitecture, advanced process technology and silicon optimizations to deliver faster performance than processors of the previous generation. CPU core performance of Core i7-7700HQ is 8% faster than i7-6700HQ under average usage. CPU multimedia performance is enhanced, making it 10% faster than i7-6700HQ. 4K video decoding/transcoding is also improved 15%. The new media engine of the 7th generation Intel Core H series processor also delivers power-efficient VP9 and HEVC 10-bit hardware acceleration. 4K video playback with HDR visual quality is therefore significantly improved versus previous generation processors. 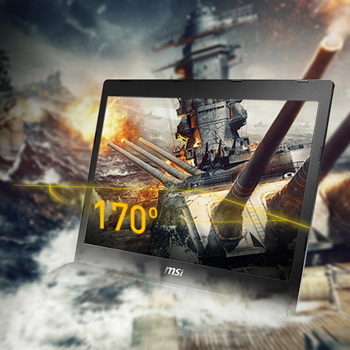 MSI is the world's 1st gaming notebook to have this latest NVIDIA next gen. GPU solution onboard. Performance of NVIDIA's next generation GeForce® GTX 1070 GPU is expected to improve more than 40% than GeForce® GTX 900M Series. 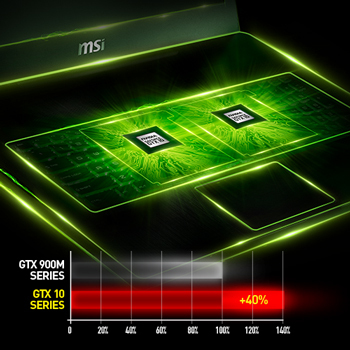 With the innovative Cooler Boost cooling solution and MSI’s special gaming features catered for gamers, the NVIDIA's latest GeForce® GTX 1070 GPU shall be able to release its full performance completely on MSI gaming laptops. By offering “one click to VR” solution and a totally immersive and smooth gaming experiences, the new MSI gaming laptops is going to shatter desktop performance cliché and amaze gamers with refreshing point of views on MSI gaming laptops. 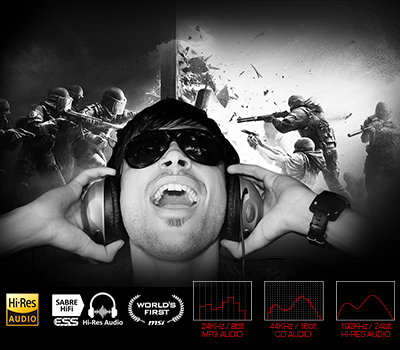 To deliver the crispest sound signal to gamers' ears, MSI uses special hardware and software amplifiers to get the best audio experience for gamers, especially using a daming headset. Dragon Center provides six functions to get a total control of your personal computer : easy access to all apps at once (App Portal), real-time system performance monitor (System Monitor) and LED effect control (LED Wizard). 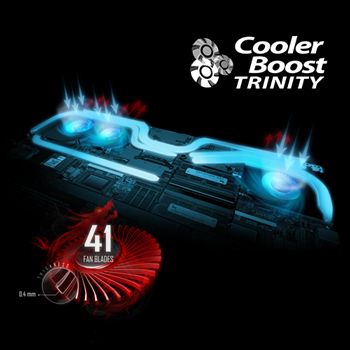 Moreover, under System Tuner tab, users may adjust parameters through MSI VR Ready / X Boost / True Color technologies, modify Fans Speed and activate the SHIFT technology to achieve Dynamic Temperature / Performance Balancing or to overclock the system GPU. All of these functions can be done in just one click. Dragon Center empowers users to facilitate tweaking process without occupying system resources." Do you have you a question about the MSI GS73VR 7RG Stealth Pro 17.3 inch Gaming Laptop - Intel Core i7-7700Q, 16GB RAM, 256GB SSD, 2TB HDD, GeForce GTX 1070 8GB, WLAN, BT, Windows 10 Home 64-bit?